Supporters of the strict laws say that allowing programs like Abbott’s encourages homelessness. Cal Deal, a 65-year-old former journalist who videotapes homeless people in the city and says they commit crimes, cause sanitation problems and need more help than simply food. Ron Book, chairman of the Miami-Dade County Homeless Trust, told city lawmakers at the raucous, Oct. 21 meeting at which the new laws were passed that they would have a positive effect. Sims acknowledged that Fort Lauderdale has a problem with homelessness, but said the answer isn’t laws that make it hard to feed people. “It’s not an easy issue, not cut and dried,” Sims said. “But what is cut and dried is that people deserve to eat when they are hungry. And people of faith are compelled to reach out to people who are in need. “We need to work harder to solve the problem, rather than just shutting it down,” he added. Abbott said there is a simple explanation for Fort Lauderdale’s outsize homeless population. Abbott, a World War II veteran who won two Purple Hearts as an infantryman, said he won’t stop the fight he has dedicated to his wife. In addition to feeding the homeless, Love Thy Neighbor operates a culinary training program that Abbott says has helped more than 400 people learn food service skills. But the food programs have gotten him in trouble for years. 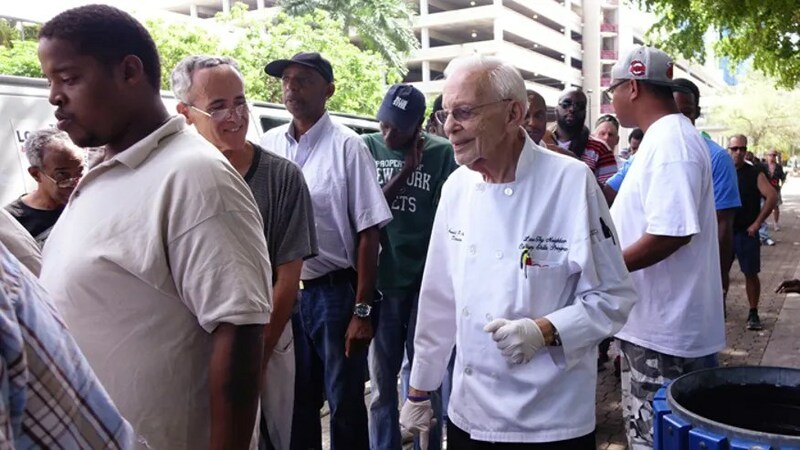 In 1999, the city tried to stop Abbott from feeding the homeless on Fort Lauderdale Beach, the same location he plans to go to Wednesday. Abbott sued and won, and says he will go back to court if necessary.